Measuring your heart rate is any easy way to gauge your health, as it provides a real-time snapshot of your heart muscle function. For most adults, a normal resting heart rate—the number of heartbeats per minute while at rest—ranges from 60 to 100 beats per minute. A normal heart rate can vary from person to person. However, an unusually high or low resting heart rate can be a sign of trouble. A normal heart rate for adults is typically 60 to 100 beats per minute. A heart rate that is slower than 60 beats per minute is considered bradycardia ("slow heart") and a rate that is faster than 100 beats per minutes is termed tachycardia ("fast heart"). There are some experts who believe that an ideal resting heart rate is closer to 50 to 70 beats per minute. Regardless of what is considered normal, it's important to recognize that a healthy heart rate will vary depending on the situation. Among healthy people, a slower heart rate can be due to being physically fit, a medication, or sleep patterns. However, a slower heart rate can indicate a sign of disease including heart attack or other heart disease, certain infections, high levels of potassium in the blood, or an an underactive thyroid. On the reverse side, a fast rate in healthy people can be because they are exercising, nervous or excited, using a stimulant or are pregnant. The health conditions that are associated with a fast heart rate include most infections or just about any cause of fever, heart problems, certain medications, low levels of potassium in the blood, an overactive thyroid gland or too much thyroid medication, anemia, or asthma or other breathing trouble. By monitoring your heart rate, you can help track trends and patterns that are personal to you. 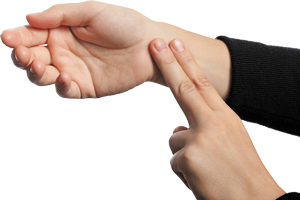 According to the Harvard Medical School Special Health Report Diseases of the Heart, it's easy to check your pulse using just your fingers, either at the wrist or the side of the neck. At the wrist, lightly press the index and middle fingers of one hand on the opposite wrist, just below the base of the thumb. At the neck, lightly press the side of the neck, just below your jawbone. Count the number of beats in 15 seconds, and multiply by four. That's your heart rate. Do not measure your heart rate within one to two hours after exercise or a stressful event. Your heart rate can stay elevated after strenuous activities. Wait an hour after consuming caffeine, which can cause heart palpitations and make your heart rate rise. Do not take the reading after you have been sitting or standing for a long period, which can affect your heart rate. You can also use different types of heart rate monitors to check your heart rate. But be aware that most have not undergone independent testing for accuracy. One option is a digital fitness tracker. The most reliable ones use a wireless sensor on a strap that you wrap around your chest. The sensor detects your pulse electronically and sends the data to a wristwatch-style receiver that displays your heart rate. Others have sensors on the back of the wristwatch itself. These sensors, which are slightly less accurate, determine your heart rate by measuring blood flow through the skin. Various smartphone apps to check your heart rate are also available. For most of these, you place your finger on the phone's camera lens, which then detects color changes in your finger each time your heart beats. Treadmills, elliptical machines, and other exercise equipment found in fitness centers and some home exercise rooms often feature handgrip heart rate monitors. These rely on trace amounts of sweat from your palms and the metal on the grips to detect the electric signal of your heartbeat. But experts don't recommend these to check your heart rate, as they are notoriously inaccurate.